Have you ever thought about doing a series of stained glass pictures all related to the same theme? You might be surprised that you get MORE ideas for designs than you ever have before. Why is that? We need to create a framework for our creativity before it can be set free. A theme helps us overcome that horrible ‘blank page’ feeling and helps stained glass pictures come to us more easily. Take a look at these three stained glass pictures by Susan Huff. Can you see how setting a theme of ‘Vanishing Pollinators‘ has focussed her mind and helped her design them? If you have a theme you can start looking on Pinterest with an aim in mind, rather than clicking and collecting stained glass pictures that you never use. Your series of stained glass pictures can be linked in lots of different ways. They could be connected by size and shape as well as theme. Susan’s are all square. Knowing that they are all going to be the same shape before you start designing will help you structure your drawings. You could use the same colours and/or the same glass in each of the panels. What about designing four panels based on the seasons? In her blog ‘Glazed Expressions‘, Jane Brocket has an example of this. Her new book has an unusual take on stained glass; she helps us LOOK at stained glass rather than telling us ABOUT it. 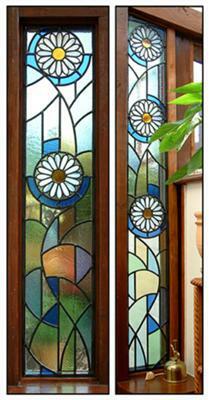 I had two plain glass panels either side of a door to a garden room which were crying out for something decorative! I used copper foil to create the daisies and then leaded them into the panels. Julia, these are absolutely fantastic! I bet they are really uplifting every time you go into your garden room. I can imagine them leaving coloured daisies all over the floor when the sun shines. I was inspired by a beautiful photograph of Opuntia in bloom, and wanted render it in stained glass applique. The petals presented a problem, as they showed a wide gradation from intense yellow-orange at the bases to papery white towards the distal edge. I also wanted some striking texture in the petals. We had on hand some rippled Youghiogheny Laburnum obtained in a boxed assortment, but it was nearly devoid of color. Rather than divide the petals unnaturally to obtain two different colors, I decided to enhance the too-scant color of the Laburnum by daubing Pebeo Sun Yellow paint for glass and a Pebeo deep orange on the reverse of the Laburnum, allowing the color to grade into the pale whitish glass per se. This painting was done on larger, odd-shaped glass pieces, for later cutting and shaping. Then the usual overnight paint drying, oven baking next day. You can’t score a glass surface that has been painted, so it must be sawn (which I did). Well here we go again with your wonderful choice of glass. That’s one of the most difficult things to teach – building up an eye for the qualities of each individual sheet of glass, and how to apply your chosen glass to good effect in a panel. I also like the fact that you use paint to enhance the overall effect in a subtle manner. With glass designs, one of the main concerns is always the balance of darkness and light – sometimes you want to minimise it, at other times (like here) it’s good to make the contrast really dramatic. What that does in this instance is to make the flowers seem wonderfully delicate and emphasises the vigorous growth around them. The theme of this church window is based upon marriage, unity and the gifts of the Holy Spirit. The interlocking rings and the rising columns represent spiritual and physical union, growth, and the journey of a relationship. The rich coloured areas which branch out at the top of the window reflect on blossoming love and companionship. In the blue vertical stripes there are words that rain down upon the rings which spell out the twelve gifts of the Holy Spirit. I have used various techniques in the fabrication of this windows including acid etching, painting, staining, enamelling and kiln forming. Thanks for your photo Alan, it looks great. I particularly like the contrast of the more formal shapes at the top spilling down into the organic shapes at the bottom. I love the idea of the words ‘raining down’, I always think text works really well in a church window. This is a commissioned applique panel destined for a remodeled swimming-pool house in Orlando, Florida: an erstwhile kitchen window will become a light-box bearing this 23X34″ piece. Because the panel had to be shipped, we were generous with the Weldbond, for strength — hence the temporary shadows and cloudiness, which in time will cure to clarity, eventually leaving the opalescent glass brightly back-lit. We like to shop Kokomo’s odd-batch specials, where one-off productions that didn’t meet specs are offered at a discount: their recent mustard-colored odd-batch was perfect for the background in this piece. I love this colour palette! The mustard is a perfect backdrop for the green and blue. Nice. It’s big, too. I’m assuming the background glass is tempered (toughened) for safety. This glass painting is based on an original aboriginal picture using clear float glass the outlines are painted in a matt black then I added the browns and yellows to give effect, the frame I made from old timber and carved it with aboriginal art. This goes to show what you can do with float glass. You’ve really captured the spirit of aboriginal art. The fact that you haven’t completely covered the glass with paint but left some clear adds to the dreamlike atmosphere. I also love the frame. How you hang or display work is of equal importance as the glass, and this really adds to it. Thanks for putting it on the site. A client wanted a trio of simple circular panels for inside doors, in themes of special significance to his wife: one theme was the honeybee, and this is what I made. Love it love it, and am not surprised it got picked up for a logo – it’s simple and yet really gives you a sense of being immersed in pollen and flower. For more inspiration for stained glass pictures have a look at these painted panels you might find them challenging or you might love them!